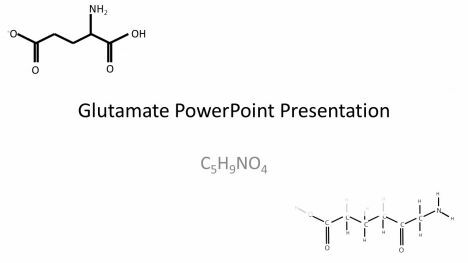 This free PowerPoint template shows a molecule of the neurotransmitter and amino acid Glutamate. 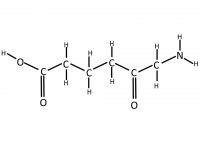 This is a chemical within the body, which sends signals from cell to cell. Generally these signals happen in the brain, hence the term neurotransmitter. It carries a signal to a receptor, which causes an effect. 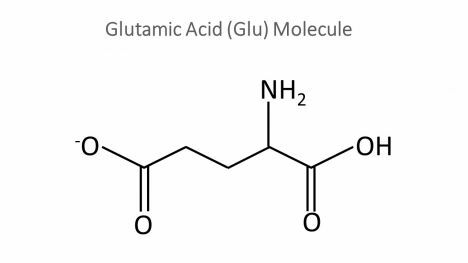 Glutamate is an essential amino acid which is extracted from the protein you eat in your diet. It can also be converted into another neurotransmitter called GABA. 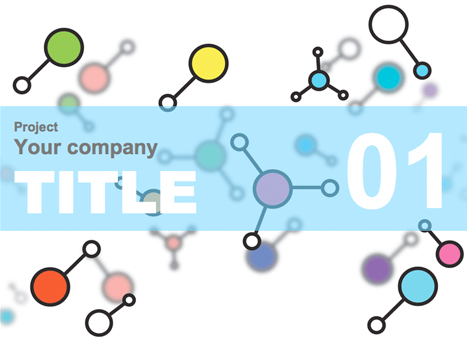 Within this PowerPoint template, there are three different types of molecular representation. On the second slide is the skeletal formula. This type of diagrammatic representation does not show hydrogen atoms, and the carbon atoms are represented as lines, the corner or end point demonstrating the carbon atom. Additional groups are added to the carbon ‘skeleton’, for example an oxygen and hydrogen group, an alcohol group, is shown as OH. On slide 3 is the ball and stick model of the molecule. 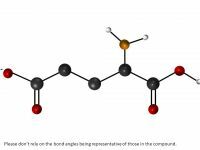 The atoms of the molecule are shown as balls, and the bonds between them are the sticks. Finally there is the displayed structure of the molecule, showing all of the atoms and bonds connecting them. This free PowerPoint would be extremely useful for biology and chemistry presentations as well as for biochemistry, neuroscience, pharmacology and medicine presentations. It would make for an interesting background for a presentation on diseases that are caused by a problem with Glutamate, such as Multiple Sclerosis, Alzheimer’s Disease, Schizophrenia and depression. If you have enjoyed this template and are downloading it for your presentation, please let us know the title of your presentation in the comments box below.